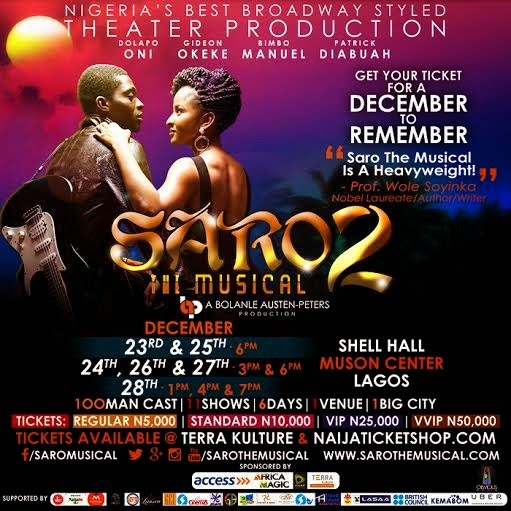 Welcome to Linda Ikeji's Blog: Saro The Musical returns this December to rock Lagos for 6 days! 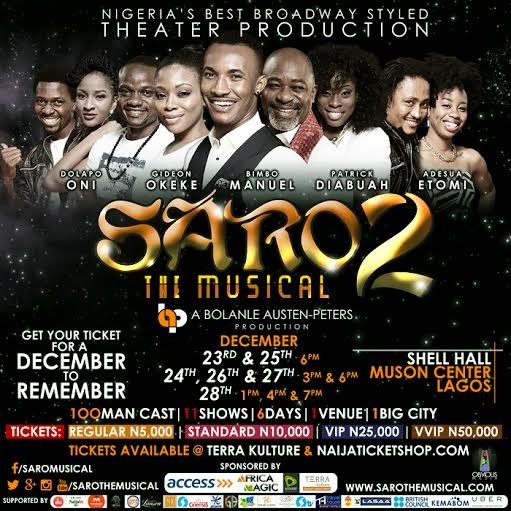 Saro The Musical returns this December to rock Lagos for 6 days! As the city of Lagos prepares for the highly anticipated return of Saro: The Musical, we are very excited to share some very exciting inside scoop on this year's shows! As part of the vision to improve last year's outing, this year's shows will see huge and exciting changes, all in a commitment to produce the best experience for our audience. In that spirit, we are excited to announce some new additions to this year's Saro cast! 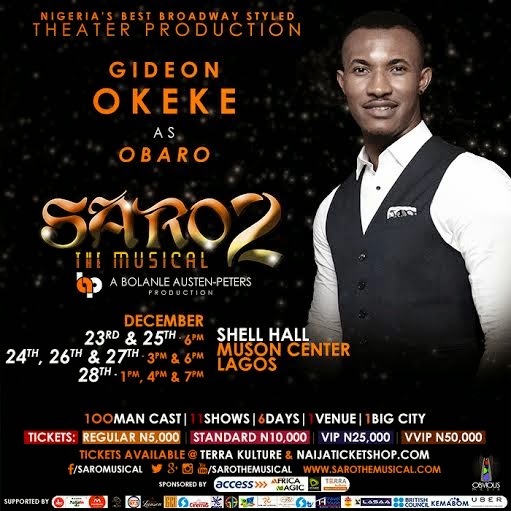 This Christmas, joining the already amazing cast and crew of Saro the Musical will be prolific actor Gideon Okeke, celebrated television show host Dolapo Oni, and revered movie veteran Bimbo Manuel. 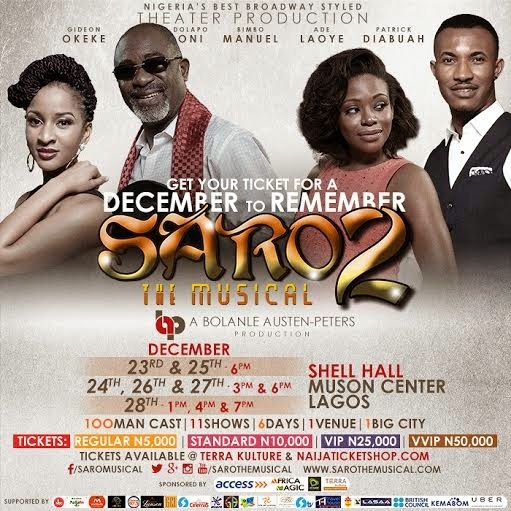 Rturning with a 100-man cast, Saro – a Bolanle Austen-Peters Production – will deliver 11 outstanding performances in 6 days, all taking place at the prestigious Shell Hall, Muson Center, Lagos from the 23rd of December, 2014. This year’s show - proudly sponsored by Access Bank PLC - will be delivering an even bigger showcase of dazzling performances in lovely and colorful costumes, enigmatic and well-choreographed dance steps, and an exquisite fusion of jazz, afro-beat, hip-hop, highlife, juju, apala, and such other contemporary Nigerian music genres. Saro is the story of four young people in an age-old search for greener pasture, who migrates to Lagos with little else but an abundance of hopes and dreams, where they are duly reoriented by the people and experiences they encounter on their journey of self-realization. 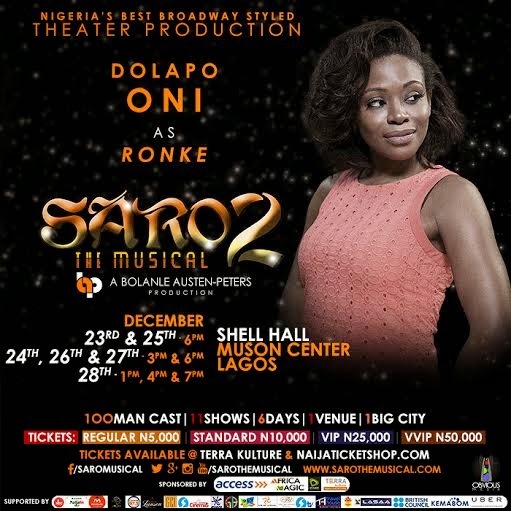 Weaving together the trials, misfortunes, love, and destinies of the foursome into a 14-act masterpiece, Saro tells the unforgettable and inspiring story of the journey to success in a city filled with broken dreams, as we see Lagos personified by its numerous colorful and unforgettable characters, frenetic pace of living, and endless drama. Its successful showing at the grand ballroom of the Oriental Hotel, Victoria Island, drew notable names in the Nigerian arts sector such as Prof. Wole Soyinka, Olu & Joke Jacobs, Taiwo Ajai-Lycett, Odia Ofeimun, Tunde Kelani and Femi Odugbemi, Teju Babyface, and Steve Onuh aka Yaw, as well as dignitaries like Ex Governor of Lagos State; Bola Tinubu, Disu Holloway, Edem Duke, minister of tourism, arts and culture, Arunmeh Otteh DG SEC, various ambassadors and other notable names from government and the private sector, and garnered critical praise and attention from media as well as critics all over the world. With high praise showered on the play and its production team, a number of impressed audience members expressed their hopes that the show would tour the country, and eventually be showcased to the world. This year, Saro will return to fulfill the demands of Nigerians who have clamored for its return. 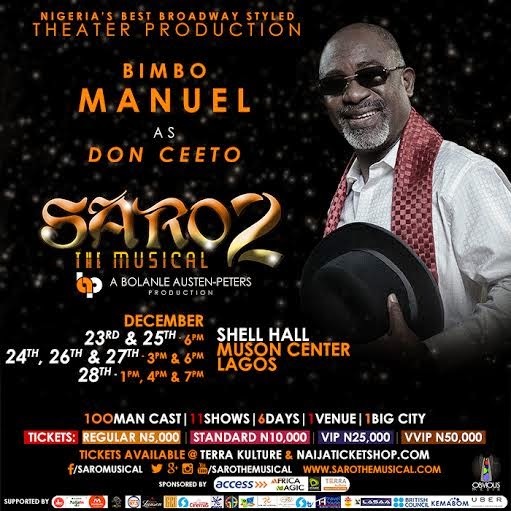 Boasting a 100-man cast performing on a one-of-its-kind custom-built stage, Saro traces and pays homage to Nigeria’s rich musical history by beautifully rendering some our greatest hits over the years, while also delivers its own ingeniously composed original music. Masterfully combining this with the impeccably choreographed dance routines and unforgettably charged performances delivered by a talented and attractive cast, Saro is a theatrical joy that gallops swiftly through its fourteen acts to tell the story of Lagos settlers; immigrants who come from all over the country and indeed the world, to create a new and hopefully successful life in this bustling and exciting melting-pot. Whoa, reads like it would be fun! Okay I have no idea who that is. last years saro was a waste of my time....i hope they have hired a better director and performers...it was all noise and zero substance! As someone described it.."All bling with NO gold". but i ll probably still watch it with hopes that they will have improved this year..... please lets have KAKADU in stead...fantastic play! Bolan;e Austin Peters, kindly try to make stage play lovers like us happy this time o...we are counting on you! KAKADU is a nice show but not in the same class with SARO! SARO is way ahead! if you are a true lover of musicals and if you are not biased, you will agree that SARO is great! i saw it last year and i am changing my travel itinerary to see it again this year. this is gud.I wish them a good concert.